UNIVERSAL - It can fit most spreader bar hammocks ranging from 11 1/2 ft to 13 1/2 ft in length and like hanging your hammock between trees.NOTE: hammock is not included. OVERALL DIMENSIONS - 14.76 ft (L) x 3.87 ft (W) x 4.8 ft(H). STURDY -Includes steel suspension rings and chains that will support up to 330 lbs. EASY TO SET UP-Set this beautiful wooden hammock stand up very easy and not complicated and start enjoying the great outdoors quickly. BEAUTIFUL & COMFORTABLE -- Its roomy proportions let you really stretch out for maximum relaxation and the beautifully stained sturdy wood frame will add elegance to your back or front yard. 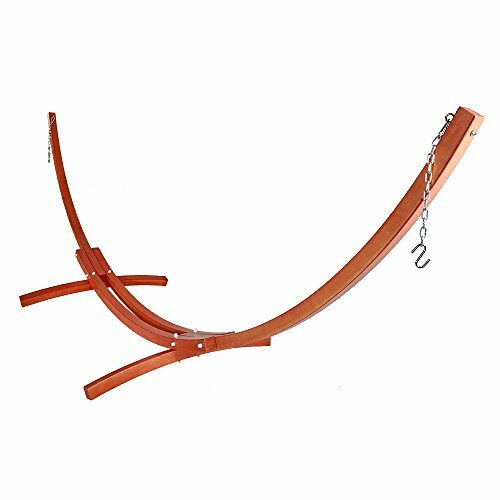 OnCloud 15 FT Wood Arc Hammock Stand with Hooks and Chains —- made of beautiful and durable wood, it is not only easy to use, but also provides you with ultimate comfort and relaxation. It can offer a combination of luxury and quality. Compatible with most spreader bar hammocks and hanging hardware is included so you can get to lounging as soon as possible. FTC Required Website Disclosure: You should assume that the Owner of this Website Ola Uno Corporation has an affiliate relationship and/or another material connection to the providers of goods and services mentioned in this website and may be compensated when you purchase from a provider. You should always perform due diligence before buying goods or services online. This Website Owner does not accept payment or merchandise in exchange for any of the reviews displayed or mentioned themselves. They are written objectively and with honesty from direct consumers of shown providers. The owner of this website, Ola Uno Corporation, is a participant in the Amazon Services LLC Associates Program, an affiliate advertising program designed to provide a means for sites to earn advertising fees by advertising and linking buyahammock.com to Amazon properties including, but not limited to, amazon.com, endless.com, myhabit.com, smallparts.com, or amazonwireless.com.